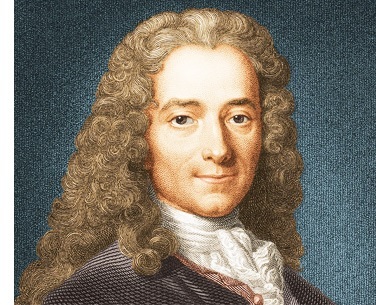 Voltaire (1694-1778) - The figure most commonly associated with the Age of Enlightenment, Voltaire was a French writer, humorist and philosopher famous for his criticisms of French societal conventions and his distaste for the Catholic Church, as well as Christianity as a whole. His real name was François-Marie Arouet; he adopted the pseudonym "Votaire" in 1718 as an anagram of his surname in Latin. Born in Paris (and died in Paris), he was educated at the prestigious Lycée Louis-le-Grand (named for King Louis XIV). It was there that his attitude toward Christianity must have been shaped, for he was taught by Jesuits. As a student, he learned Latin and Greek, and became fluent in Spanish, Italian and English. His father was a lawyer and wanted his son to follow in his footsteps. But Voltaire was set on becoming a writer, which he did. The power of the pen provided him with a way to criticize authorities, both in government and the church. Not surprisingly, his outspoken nature against those in power frequently got him into trouble beginning in 1717. He penned a satirical verse which accused Philippe II, Duke of Orléans of having an incestuous relationship with his daughter. The poem landed him in prison (at the Bastille) for eleven months. However, while in the Bastille he wrote his first play, Oedipe, a retelling of Sophocles' famous work, Oedipus the King. It was at this time that he first used the name "Voltaire". The play opened at the Comédie-Française in 1718 and was a hit (Voltaire was even personally congratulated for the play's success by Duke Philippe II). He was now a prominent figure in French society and used his recognition to try and shape it. In the late 1720s he spent three years in Great Britain (a form a exile after he got into trouble with the aristocrat, Chevalier de Rohan) which influenced him tremendously. He was greatly impressed by England's constitutional monarchy as opposed to France's absolute monarchy. He also became a devotee of Shakespeare and a personal acquaintance of Isaac Newton (it's believed that Voltaire is the source of the tale of the apple falling on Newton's head, which is likely an exaggeration of actual events). In 1727, he attended Newton's funeral. Voltaire was voluminous writer and his works covered multiple subjects. He wrote plays and novels, poems and essays. He wrote fiction, history, science and philosophy. In all, he wrote 20,000 letters and 2,000 books. On Christianity, he wrote, "Christianity is the most ridiculous, the most absurd and bloody religion that has ever infected the world," and he predicted that within a century of his own death it would become extinct. This did not sit well, of course, with many, including Wolfgang Amadeus Mozart who, on Voltaire's death, wrote to his father, "The arch-scoundrel Voltaire has finally kicked the bucket...".